These webpages honour six of the influential women associated with Hemyock Castle: Links to other webpages in this series. 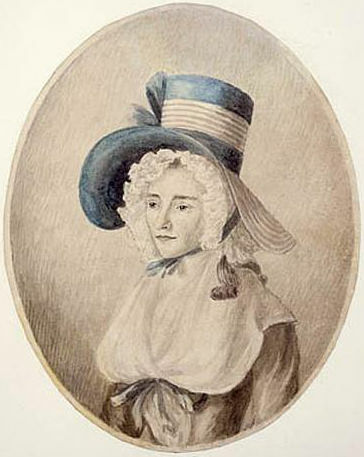 General&apos;s artistic widow who documented their travels in 18th century Canada & later was influential in West Country life; including until 1832 – even as a woman – having the right to vote. Born Elizabeth Posthuma Gwillim in Whitchurch, Herefordshire, England; then orphaned; brought up by Margaret her mother&apos;s youngest sister & her husband Admiral Samuel Graves. They lived at Hembury Fort House on their estate near Honiton, Devon. Elizabeth married General John Graves Simcoe & later accompanied him when he was appointed the first Lieutenant Governor of Upper Canada; now Canada&apos;s Toronto / Ontario region. An accomplished artist, Mrs. Simcoe kept illustrated diaries of their experiences and travels. These fascinating & attractive documents are housed in Canada. They can now be viewed on the Internet. The Simcoe family lived at Wolford Lodge near Dunkeswell. General Simcoe was involved in several military campaigns and was the first Lieutenant Governor of Upper Canada. He had been appointed as the next military commander in India, but suddenly died prematurely in 1806. Today General Simcoe is still highly respected in Canada, not least for abolishing slavery in Upper Canada in 1793. Several natural features and buildings are named after him. General Simcoe is buried nearby at their former chapel of Wolford Lodge, Devon, which is now designated officially as Canadian soil. General Simcoe had purchased Hemyock Castle in the late 18th century and appears to have intended to restore it: Some work seems to have been started, but apparently this project was abandoned following his death. Mrs. Simcoe lived for many years after General Simcoe died suddenly in 1806. As well as bringing-up their children, Mrs. Simcoe was influential. Her extensive property, including Hemyock Castle, could have entitled her to vote... until all women lost the vote through the 1832 Great Reform Act. Mrs. Simcoe battled determinedly to preserve her family&apos;s property rights during Hemyock&apos;s 1814 Inclosure Act when formerly shared open fields & "common land" became private property. However Mrs Simcoe was a great local benefactor, restoring Dunkeswell Abbey Church and Dunkeswell Parish Church. She and her daughters ran several projects to help the poor. In Hemyock, where she was a major land owner and Lord of the Manor, she paid for the extension of St. Mary&apos;s Parish Church and also appears to have supported Hemyock&apos;s Dame School which was in a small building where Hemyock&apos;s War Memorial now stands. In correspondence between Mrs. Simcoe and one of her philanthropic friends about Mrs. Collins the teacher, Mrs. Simcoe mentions that she was going to Hemyock to see Mrs. Collins to see what she was teaching, and hinting that if she approved of this little school, she would contribute towards it. Thus Mrs. Simcoe may well have helped in the early education of the Hemyock children.